Since we receive milk daily from Iowa family farms, we have lots of fresh cream to make our Whipping Cream. Our Whipping Cream is not ultra-pasteurized because we believe this changes the fresh flavor and impacts whipping. The result is cream that whips faster and maintains its body and texture. 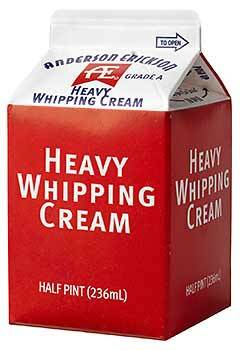 AE Heavy Whipping Cream is all natural, with a pure, fresh taste because that’s how we like it. Oh, and we leave out the preservatives too.